The world around us can be portrayed by an artist’s perception in a unique way that allows imaginations to run freely. The physical world has been mimicked many times to give off different takes of our own perceptions and beliefs of what we can see. But what about creating art based on a metaphysical concept? 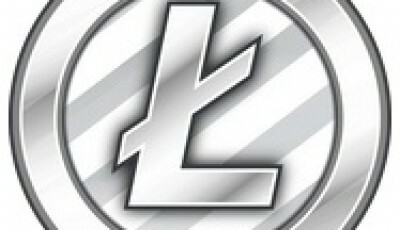 A concept like bitcoin? 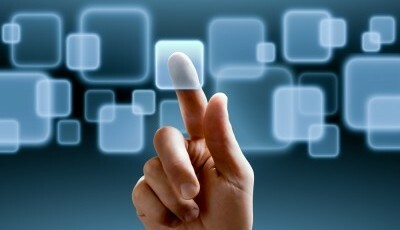 In actuality, bitcoins only exist in the digital space as numbers on screens. However, that didn’t stop some talented artists in making bitcoin aesthetically pleasing to the human eye. They took the concept of bitcoin and news surrounding it to come up with some of the most creative art filled expressions of bitcoin one could possibly imagine. Here is a look at the top 5 bitcoin inspired works of art to come out of the minds of bitcoin enthused artists. Shown off at San Francisco’s Bitcoin Art Fair; along with various other bitcoin inspired works, Bitsoaps are handcrafted bars of soap that show an appreciation to digital currencies. Each soap molded in the shape of a circle, and has a digital currency-related image in the center. 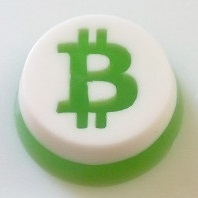 One version of the scented soap has the familiar bitcoin symbol across it, while another has the adorable dogecoin mascot plastered on the bath-time instrument. Bitsoap has definitely proven loyal to bitcoin, both financially and in good taste. Bitcoin history, just as all history, has its good and its bad moments in time. The digital currency community will never forget the tragedy that was the collapse of Japanese bitcoin exchange Mt. Gox. Artist Thomas-Joseph Carrieri also exhibited his works at the San Francisco Bitcoin Art Fair, one of them serving as a reminder to when bitcoin hit a crucial road bump in its early existence. 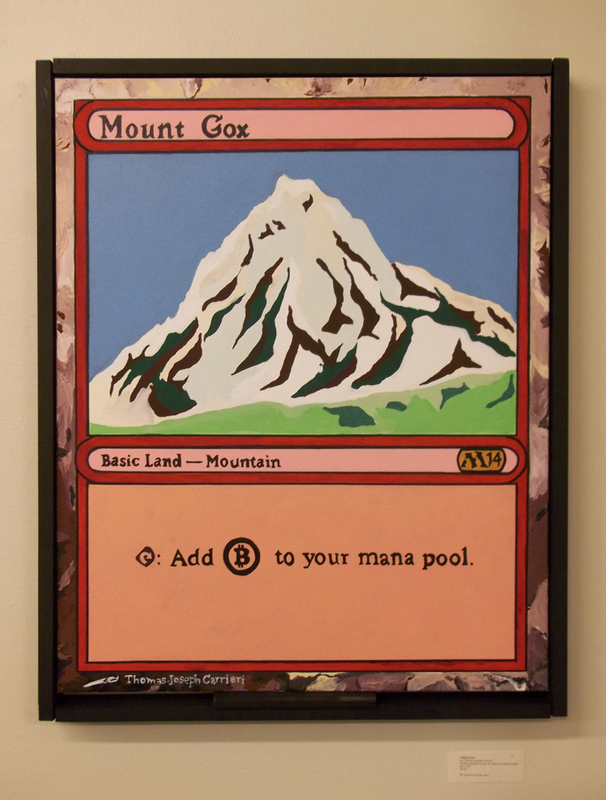 Carrieri’s Mount Gox takes the name of the exchange to heart, as a mountain is the focus of his work. However, what is more eye-grabbing is that he based the piece off of the popular card playing game, Magic: the Gathering. Each Magic card works to strengthen a player’s deck to try and outwit an opponent. The caption on Carrieri’s card reads: “Add Bitcoin to your mana pool.” His work manages to bring together three different realms in one image. The realm of card games, the art world, and bitcoin. Megan Miller is an artist based out of Los Angeles. She wanted to bring the digital world of bitcoin to life using her passion of taking pictures. The task may not make much sense, as bitcoins are not physical objects. So, how could one use a camera to capture them? This puzzling dilemma was no puzzle for Miller, as she snaps photos of bitcoin being used in everyday life. That means people who are interacting with bitcoin end up being her works of bitcoin art. Her curiosity and passion to make art through the camera’s lens pushed her to learn more about the digital currency. In one of her photos, a man is seen scanning a QR code with a smartphone. 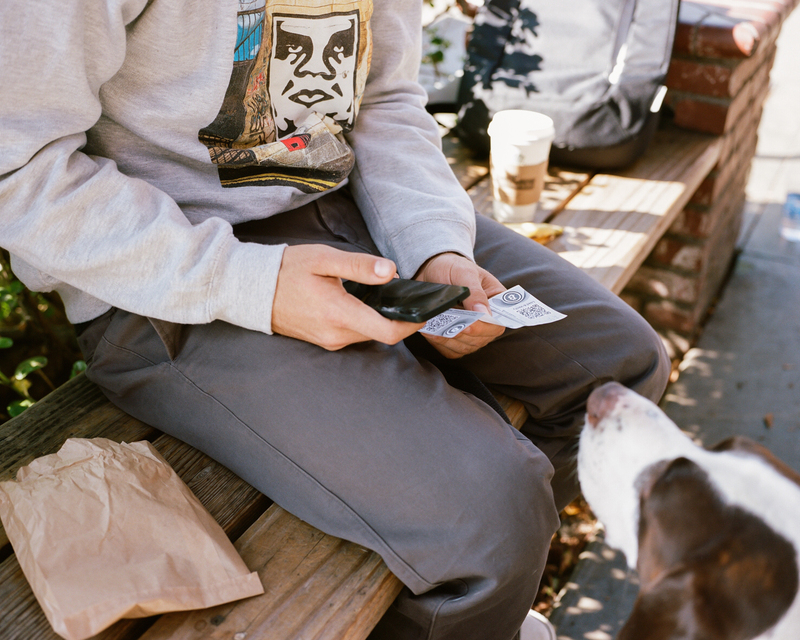 This shows off bitcoin’s efficiency, as the user is sitting on a bench with his dog. Bitcoin transactions can be made so simply, without the need of a third party. Miller’s pictures portray moments in time for those using bitcoin, as well as bitcoin’s technology. This also goes to show that art can be anything the mind wants art to be, since art is in the eye of the beholder. Whether we look at the inside of a technological device, or the images and services they produce, technology is a major form of art. In Jeff Gomes’ painting titled Satoshi Nakamoto, Gomes pays tribute to one of the most intellectual minds of our time. Known to be the mystery man behind bitcoin, Nakamoto is believed to be a man or small anonymous group that came up with bitcoin’s encrypted technology. 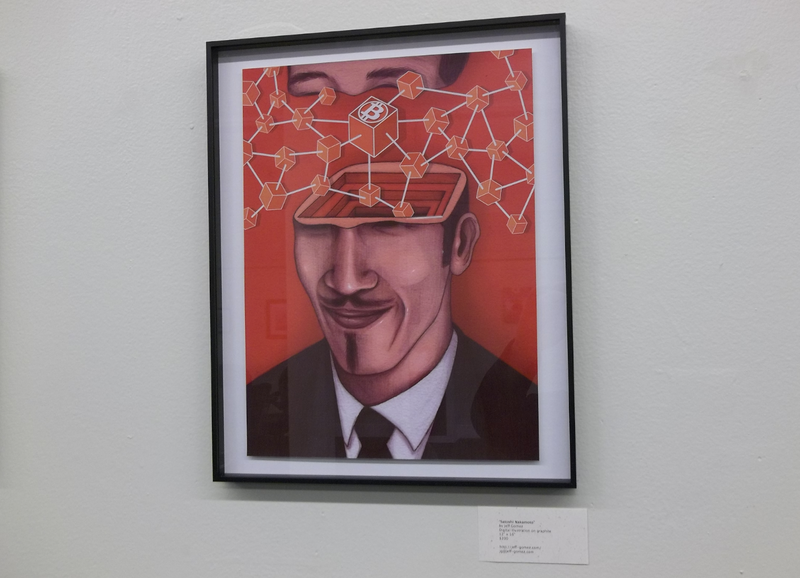 Nevertheless, Gomes represents Nakamoto’s genius and secret identity with his piece, which was also showcased at the Bitcoin Art Fair on March 6th. The piece offers insight on what the inside of Nakamoto’s brilliant mind may look like, while somewhat concealing his identity. In the portrait, Nakamoto’s head is filled with blocks of bitcoin knowledge that would have never seen the light of day without his doing. 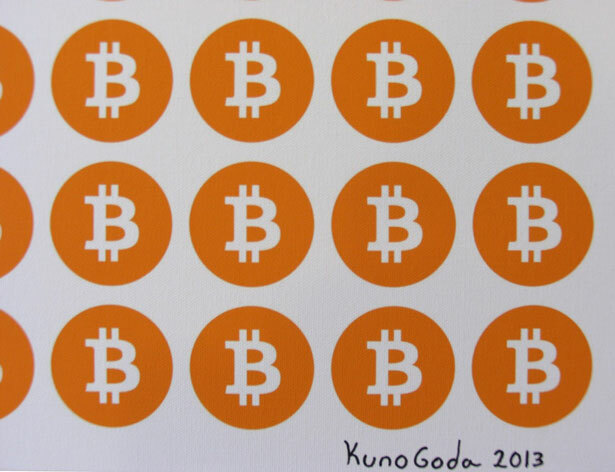 Kuna Goda’s 200 Bitcoins pays homage to not only bitcoin, but to the inspiration that set the basis of the work’s art style. Andy Warhol’s 200 One Dollar Bills put the gears in motion for Goda to make his own money-related piece. What truly made the spirit of bitcoin come to life in this piece was that it was sold in bitcoin. However, both Goda and the buyer have agreed to not reveal the exact sale price. It is said that the buyer spent less than $90,000 in bitcoin on the work. Goda bases most of his art off of technology. 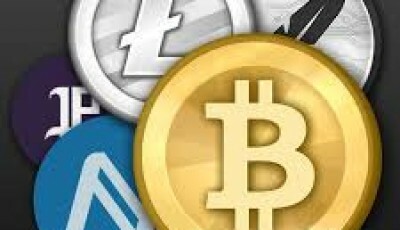 He says that his follow up to 200 Bitcoins will also incorporate the theme of money. It will identify the critical state of the US dollar. Artistic freedom is one of the most vocal forms of expression out there. For creators to devote time and effort shows how truly bitcoin is to them. 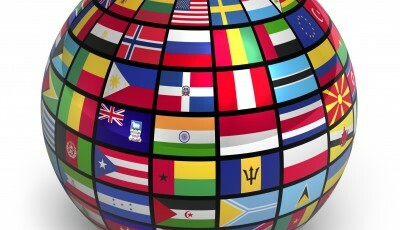 Bitcoin has the power to change the financial world for the better. Paying respect to it by allowing to be seen in a positive light is daring and remarkable. It will be interesting to see what other empowered artists create using the concept of bitcoin. Let us know some of your favorite works of bitcoin inspired art in the comments below. How can you not love the one and only Bitcoin Jesus over @bitpremier ! !